Kane McKnight was killed after several days of violence, which ultimately resulted in the deaths of five black men, accused of robbing a local store. 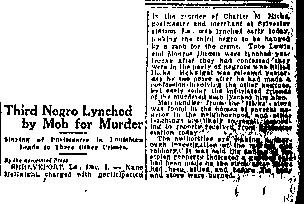 McKnight was first arrested, and escaped an attempted lynching, but later was caught and killed, along with his alleged accomplices, Toby Lewis and Elijah Durden. (See the pages for Durden & Lewis, and for Washington, Henderson & Lewis for more details). 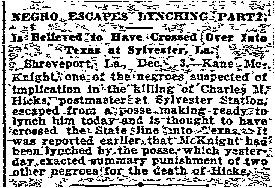 The Dallas Morning News, December 4th, 1914.